All transactions are safe and secure with a reliable history in online purchasing behind each of our associates. Buy the Nightman t-shirt to own It's Always Sunny in Philadelphia clothing and merchandise. 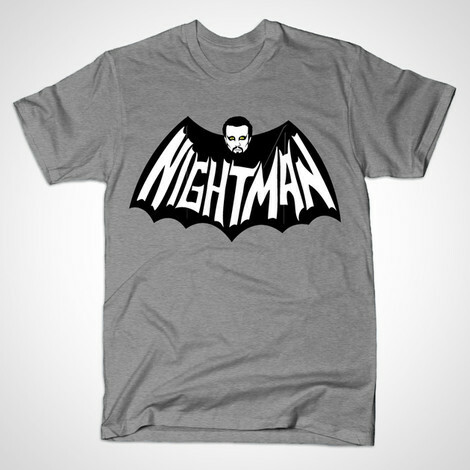 Charlie Kelly's (Charlie Day) debut attempt at songwriting began with "The Nightman," which inspired this tee. He followed it with his surprise hit song "Dayman". He later decided to turn "The Nightman" into a rock opera in the episode titled "The Nightman Cometh". Wear your Nightman shirt as you practice for your part in Charlie Kelly's musical. Pair it with a classic black Dayman t-shirt that boasts the song title and some rocking Dayman lyrics. In addition to the Nightman tee above, browse the It's Always Sunny in Philadelphia Clothing Gallery for more apparel like men's and women's clothes, kids shirts or hoodies.